Overview - Directed by Yoshiharu Ashino, FIRST SQUAD: THE MOMENT OF TRUTH is set during the opening days of World War II on the Eastern Front. Its main cast of characters is a group of Soviet teenagers, each with extraordinary abilities. The teenagers have been drafted to form a special unit to fight the invading German army. They are opposed by a Schutzstaffel (SS) officer who is attempting to raise from the dead a supernatural army of crusaders from the 12th Century Order of the Sacred Cross and enlist them in the Nazi cause. 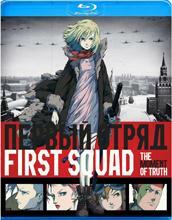 FIRST SQUAD: THE MOMENT OF TRUTH was produced by Eiko Tanaka, Misha Shprits and Aljosha Klimov. In my review for the anime, 'Redline,' I briefly addressed a common problem I have with many of the genre's films -- that they are often filled with cool ideas and high-concepts, but fail to really develop them into anything more than vague, undercooked, unsatisfying plotlines. Of course there are always exceptions -- in fact, 'Redline' manages to succeed despite falling victim to such flaws -- but unfortunately the same can't be said about 'First Squad: The Moment of Truth.' A joint Japanese/Russian production, the paranormal WWII-era tale features a decent premise, but is ultimately unable to follow through on its potential, resulting in a disposable, muddled effort that lacks originality and excitement. Set in 1942, the story follows a young female psychic, Nadya (Elena Chebaturkina), who is part of a special paranormal task force working for the Russian army. After her team is killed in action, Nadya suffers from amnesia and slowly attempts to put the pieces of her past together. Meanwhile, the German military conducts their own mystical experiments, hoping to resurrect an ancient warrior to aide them in their battles. With an army of ghostly soldiers now at the opposition's disposal, the Russians see only one option, and send Nadya into the spirit world in order to recruit her fallen comrades. Together they might be enough to take down the supernatural German threat before it's too late. Despite a few creative ideas, the plot's execution ends up leaving a lot to be desired. The film relies heavily on clunky flashbacks that slowly fill in Nadya's past, but the picture these memories end up painting is quite thin, and the manner in which all the background information is presented becomes unnecessarily complicated. The actual story is very simple (too much so) but the narrative's jumbled order of events makes it all seem very convoluted. In this case, the nonlinear structure doesn't really serve much purpose (other than causing confusion) and a straightforward chronological approach might have worked better. Characters are disappointingly dull, with very little personality. Despite an effectively creepy introduction, Nadya makes for a pretty weak protagonist, and even after her past is clumsily revealed, there just isn't much to latch onto. The rest of the squad is even less developed with very little setting each member apart. None of the supporting cast gets enough screen time to offer any real level of distinction among them, making it hard for the audience to actually care about their mission. The movie wants to forge a compelling bond between the group, but none of it ends up resonating. The animation style is standard anime fare, with traditional character designs and some subtle CG work mixed in for vehicles. Though there is definite skill and artistry on display here, movement is a little stiff, lacking excitement. There are a few solid action scenes spread around, but even these sequences aren't very dynamic and are all far too short to leave much of an impact. The climax is especially disappointing with a big supernatural showdown that ends way too quickly and abruptly. The finale itself really doesn't provide much of a conclusion, and a weak cliffhanger seems to imply that the filmmakers hope to make sequels (or a television series). In an odd stylistic choice, the directors have interspersed live action talking head interview scenes throughout the animation. Featuring actors portraying supposed war veterans and historical experts, the participants rattle on about various topics related to the fictional plot. These elaborations add almost nothing to the proceedings and seem to exist for the sole purpose of padding out the running time. In fact, a shorter version of the movie is actually included on the disc that excises these sequences altogether. 'First Squad: The Moment of Truth' shows some promise, but the narrative is underdeveloped, the characters aren't very interesting, and the animation is mostly mediocre. Even the various supernatural plot points lack originality. When one takes out the unnecessary live action interviews, there's really only about an hour worth of material here. Factor in the rushed, cliffhanger ending, and this feels more like a TV pilot than an actual movie. Big fans of similar anime efforts might find some value here, but for most this is easily skippable. 'First Squad: The Moment of Truth' is brought to Blu-ray by Anchor Bay on a single BD-50 disc housed in a keepcase. Two versions of the film are offered on the disc -- a shorter, 60 minute cut, and a longer 75 minute edit. As far as I can tell, the only difference between the two versions is the inclusion of some very unnecessary live action "documentary" footage in the long cut. After some logos and warnings the disc transitions to a standard menu. The packaging indicates that the release is region A compatible. The movie is provided with a 1080p/AVC MPEG-4 transfer in the 1.78:1 aspect ratio. Backed by a solid, but not terribly impressive animation style, this is a pretty good looking disc. The source is clean but a few scenes do feature the addition of artificial grain and damage in order to reinforce an intentionally degraded look. Clarity is nice, but the animation style is quite simple, lacking impressive detail. On top of that, the art has a fairly soft, occasionally hazy quality to it. The color palette favors subdued hues, reinforcing the stark WWII era setting, but there is some pop here and there. Contrast is good with deep, consistent black levels. Banding is visible from time to time, but thankfully isn't overly distracting. The live action footage in the extended cut is also handled well, and the simple interview set ups come across perfectly fine. 'First Squad: The Moment of Truth' looks good but not great on Blu-ray. The animation style won't be blowing anyone away, but the video transfer handles the content well. The short version of the movie is presented with Russian, Japanese and English Dolby TrueHD 5.1 and Dolby Digital 2.0 tracks. The extended version features the same options minus the Japanese mixes. Subtitles are provided in English and English SDH. While not exactly memorable, the audio mix suits the story well, adding some welcomed bits of immersion to the experience. Dialogue is clean, full and prioritized nicely. Various aerial attacks, bombings, and shootouts bring some pleasing surround use, spreading whizzing bullets and swooping planes across the soundstage with natural imaging and effective directionality. Explosions carry some low end kick and dynamic range is good, with no distortion among a decent gamut of frequencies. The opening scene, which is degraded to look like old newsreel footage, does feature some pops and crackles, but these are all intentional and don't reflect the rest of the audio presentation. The mix offers solid ambiance and rear speaker effects when appropriate with no major technical hiccups. It won't exactly wow listeners with creativity, but it complements the visuals nicely. Trailers (HD) – Trailers for 'Redline' and 'Battle Royale' are included. 'First Squad: The Moment of Truth' is an underdeveloped, clunky attempt at paranormal action. The animation is decent but not very exciting, the characters lack personality, and the thin plot leaves a lot to be desired. On the upside, the disc's technical presentation is good, with nice video and audio. Unfortunately, the only supplements provided are some trailers. There is some marginal entertainment value here, but even big anime fans might be better off skipping this one.